Blast-It-All® part number (25-1088) airline respirators provide advanced protection in the harsh exposures of blasting and painting. The snug, yet comfortable, sewn-in neck cuff provides a physical barrier to airborne contaminants and helps maintain positive pressure within the helmet. A lightweight inner shell with an adjustable headband suspension holds the respirator firmly and comfortably on the wearer’s head. Airflow is channeled directly to the user’s breathing zone for easy breathing. The helmet easily accommodates beards, prescription eye wear or safety glasses. No fit testing is required. The helmet provides top impact and penetration protection. 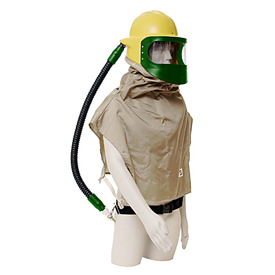 The helmet and cape help protect the worker’s entire head, face and upper body from abrasive rebound, airborne contaminants and messy over-spray. The wide-angle face-shield lens and headband suspension system are positioned for optimum visibility. Optional NIOSH approved climate control assemblies provide workers with warm or cool incoming air to maximize comfort and improve productivity. 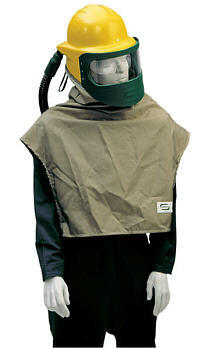 Bullard offers a wide variety of abrasive blasting capes for the 88VX Series airline respirator. Designed with user protection and comfort in mind, Bullard capes allow easy head and body movement and are available in a variety of different styles and materials. Each Bullard cape is NIOSH-approved for use with the 88VX and features a comfortable, sewn-in neck cuff designed to provide a physical barrier to airborne contaminants. All new 88VX capes also feature an additional nylon liner in the neck cuff for extra protection. The new 88VX capes also feature breathing tube positioning straps to reduce the pulling effect on the wearer, reduce fatigue, and to improve the routing and retention of the breathing tube. Choose the style that best suits your needs and preferences. Provides advanced protection in the harsh exposures of blasting and painting. The snug, yet comfortable sewn-in neck cuff provides a physical barrier to airborne contaminates and helps maintain positive pressure within the helmet. A double lining in the neck area enhances durability and protection.